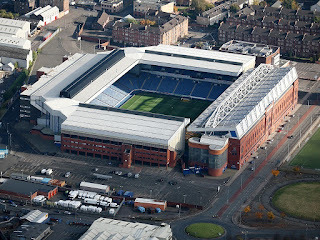 Ibrox Noise: January drama: two out, one in at Ibrox? January drama: two out, one in at Ibrox? According to media reports, Steven Gerrard still seeks a stunning January signing in the form of Liverpool’s Dominic Solanke, despite Jim White of Talksport alleging there’s little chance of this happening. And with Roma striker Umar Sadiq’s loan looking 99% to be terminated in the same window, it does highlight Rangers’ troubles up top with another disappointing display from Kyle Lafferty yesterday to add into the mix. For his part, Solanke cannot get a foot in the door of Liverpool’s match squad, never mind first team. He’s been in the youths all season, and we must admit surprise that he didn’t go out on loan in the last window. He’s one Gerrard strongly wants, and frankly most of us of a blue persuasion do too, but whether it happens or not in the face of competition from Palace and West Ham is another matter. As for Sadiq, this is one we on the site got horrendously wrong – every inch Gerrard’s Dalcio, Sadiq was simply ill-suited to Scottish football. He wasn’t bad at Hampden, we give him his dues, but somehow it hasn’t clicked at all for the big Nigerian in Govan so he will be on his way in a few weeks. Meanwhile Lafferty’s difficult display yesterday means Steven Gerrard only has Colombian star Alfredo Morelos to rely on up top, and after his impressive substitute cameo, the one-cap international will find his stock rise even higher and his manager struggle even more to fend off the hordes in January. It all could leave Rangers in a wee bit of a pickle – we could lose Morelos (for big money admittedly), Sadiq will go, no guarantee we can bring in Solanke, and the out of sorts Lafferty would be the only actual option for Stevie Ger. On the other hand we could end up holding onto Morelos, Lafferty improving his form, managing to get Solanke…and still shipping Sadiq out. Could work a number of ways. Hopefully the best one for Rangers. Three out, Pena must go. .